Calò Des Mort is a magnificent cove situtated in the eastern part of Platja Migjorn. It is a small corner of paradise, but unfortunately it is only for a few people. 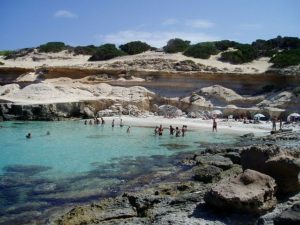 Calò Des Mort is located in the south-east side of the island, precisely between Es Arenals and Es Ram, and is considered a real jewel of nature. For those who enjoy exploring Formentera in search of the most scenic and unspoiled places, this small creek is a must-visit. To get there, starting from the village of Sant Ferran, take the road to La Mola and passed the village of Es Calò, go to Mar Y Land. When you reach the parking area next to the beach, you must take the path to the left and walk along the seashore in a raised position. Passed the beach bar named San Bartolo, in a few minutes you are above the cove. From here, holding on to a rope you can descend to the beach via stone steps carved into the rock. The beauty of the place and the view of the whole southern side of the island reward the small effort made to achieve it. 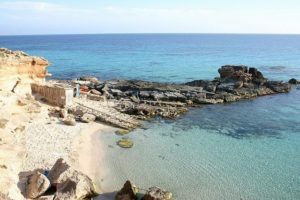 In this enchanting corner there is a small, picturesque cove, characterized by a narrow strip of beach with rocks, crescent-shaped, which is bathed by crystal-clear waters as to give the impression of being in a pool. The seabed is sandy and gently sloping and is therefore perfect both for swimmers and for those who simply want to take a bath. The only problem is caused by the small size of the beach, which also varies depending on the tide. Indeed, the available space is used up very quickly as soon as some people get to this beautiful place, and consequently it is advisable to go early and, possibly, not in high season. This beach is characterized by the presence of typical wooden houses used by the fishermen as the basis for their work where they place their equipment, and by the presence of “escars” which allow small boats to be easily removed from water. 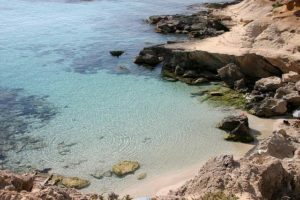 In this little corner of paradise, just as it happens in many other beaches of Formentera, nudism is very common, thanks to the particular location that makes it away from prying eyes.